UPPER DARBY, Pa. (WTXF) Police in Upper Darby held a press conference Monday that addressed the disturbing moment a day care worker pushed a child. The newly installed surveillance camera recorded the now fired daycare worker Sarah Gable shoving a 4-year-old girl down a set of steps at the Child Care of the Future Daycare Center. In the video, Gable can be seen eyeing the surveillance camera just after pushing the girl down the stairs and into a wall. The incident happened last Friday afternoon, according to officials. The camera was allegedly installed just 30 minutes before the incident, although officials haven't addressed why. 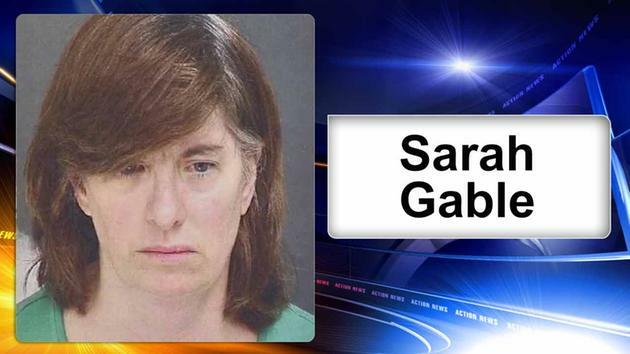 Police released the mug shot of 52-year-old Sarah Gable on Monday. The Folcroft resident was charged with simple assault and child endangerment, but police said at the conference that they will seek charges of recklessly endangering another person as well. Upper Darby police say Gable did not make a statement and was handcuffed without incident. The child is back at the daycare. Child Care of the Future Daycare center has not yet released a statement at this time.